The show host reveals that they fly back to Los Angeles tomorrow so that they will do their next show in City of Angels next week. He announces few guests that will join them like Salma Hayek, Jamie Foxx and Lily James. His announcement is interrupted by the British-flag designed prop phone when it starts to ring. The audience expresses their surprise and delight when they see Harry Styles walk to the stage and to answer the call. 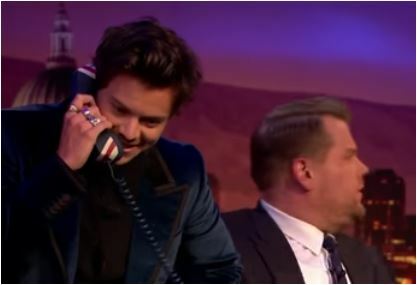 The “One Direction” member talks on the phone for a while. When he is asked about the caller, the singer quickly answered that it is a wrong number. Meanwhile, James reveals that Harry is going to perform on The Roof and it is going to be beautiful. And he jokes that the singer has magic hands.